They say that if you can ski Hunter Mountain, you can ski anywhere in the world. It’s a form of reverse psychology: the winter climate out east, especially in the relatively low-slung Catskills, is notoriously unreliable, and Hunter’s steep drops, challenging terrain and day-tripper proximity to New York City ensures only two certainties each season: that you will spend most of your time navigating your way down sheets of sheer ice, and the rest of your time – those days when fresh snow has automatically brought the crowds up from the city – looking over your shoulder to ensure that no fool is about to crash into you and necessitate a helicopter flight to the hospital. 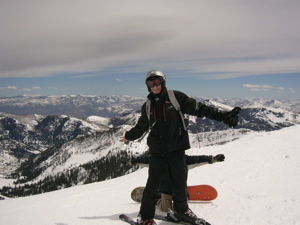 Until this trip to Utah, Campbell had only ridden at Hunter and, occasionally, neighboring Windham. (In my early twenties, I had taken three trips into mid-Europe and so at least maintained a vague memory of proper ski mountains.) So, when he hit the trails at Solitude, on a bluebird Saturday morning just 24 hours after it had received a fresh 19” of snow, he was astounded not just by the width, breadth and depth of the groomed piste, but by the very existence of off-piste snowboarding, the ability to find one’s own path down a mountain through relatively deep, occasionally virgin snow. Unlike the Catskill mountains, which are all protected forest, Solitude was stripped bare by 19th Century miners. What few trees dot the landscape were planted by the skit mountain itself and they less a dense wall around the groomed runs as in the Catskills, than occasional obstacles around which which to navigate. Sure, Campbell occasionally got too close to a tree-trunk, sunk into its deep-snow hollow and had to call me to dig him out by hand, but the thought of actually crashing into one of these trees at high-speed, such as had killed an experienced skier at Hunter earlier this year, never crossed our minds. Nor did the thought of crashing into another skier: it was hard enough to find them at Solitude, let alone cross their paths. 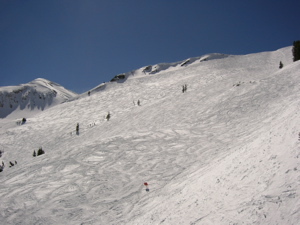 What was most delightful about Campbell’s performance – to my eyes, at least – was exactly what I’d been promised: that having learned his craft at Hunter, he found the supposed challenges of Solitude and Snowbird comparatively minor: despite increased altitude, deeper depth, steeper terrain, longer trails and vastly more space in which to get lost, he took to the Wasatch Mountains like a seal to water. I, too, found that these higher peaks provided not just a greater challenge but greater enjoyment. Bolstered by new all-terrain skis that were especially effective at carving fine swathes through powder both wet and dry, I could relax, focus on the lessons I’d learned during my winter course, and practice my moves unencumbered by crowds, obstacles or ice. I could occasionally pick up speed and pretend I was on the Nastar slalom course, but I could never pretend I was actually back at Hunter: not least because the mountain was dotted with warning signs that skiing fast was an offence punishable by loss of pass. Better to cruise casually, take on the occasional black terrain and attempt to master its bumps, or else get ahead of Campbell in the vast bowls and then look back to see him carving 100-yard wide turns for the simple reason that he could. It wasn’t snowboarding by the book, but it sure looked like fun. Just as Campbell had no other snowboarding reference but the Catskills prior to this trip out west, I had no real connotation of spring skiing – only the memory of a couple of days on Hunter in March of last year where late-season snow had collided with early-spring sunshine for the perfect local day out. 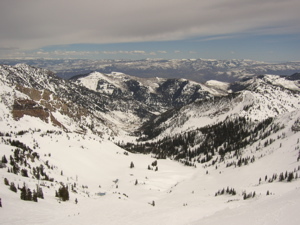 Utah was that experience amplified several times over: at Solitude, 19” of fresh snow followed by two days of 50-degree temperatures and dark blue skies; at Snowbird, one short snow-storm followed by serious spring warmth and yet, conversely, strong winds that frequently reached 50 miles an hour on the summit. Dressing for the day was a dilemma, made no easier by the fact that I had but one proper ski jacket that happened to be mid-winter thick and heat-absorbent black to boot. In addition, all the sunblock in the world could not prevent us from dehydration and mild heat stroke over our first couple of days at Solitude, though the power of SPF40 sunblock was well proven the day I let Campbell apply his own; he woke up the next morning with blistered lips and patches of bright red all over his face. Fortunately, at Snowbird if not at Solitude, we found plenty Aloe Vera; unfortunately, Campbell seemed no more willing to apply the cure than he had the prevention. Kids just have to learn things for themselves. 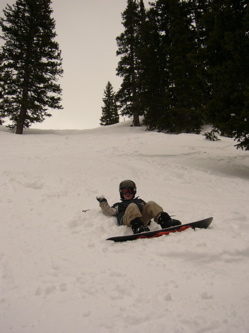 Still, when it comes to learning snowboarding, Campbell has been wisely cautious. He’s not interested in riding at high speed, he’s only just taken to rails and jumps, and he’s not yet mastered more than the most basic of tricks. His is a totally child-like enjoyment of the mountain: he loves riding right over the moguls and acquiring “air,” a process he’ll repeat often enough, with a minuimum of turns, until he feels it necessary to park his bum on the ground in lieu of a crash. He’s capable of black diamonds, but doesn’t feel the need to conquer them unless they look like fun. In Utah, he learned the additional joys of carving through deep fresh snow and darting around tree lines on the off-piste. You would expect a kid to get bored of it, but like his dad and just about everyone else up on Solitude and Snowbird, he finds it too much fun to quit this side of exhaustion. The vast expanse of the Mineral Basin: How could I possibly crash in this? “Ah, it takes at least three or four days to acclimatize to the altitude,” he allowed. I didn’t add that we’d already spent three previous days at Solitude. But I did ask which hotel they were staying at. His comment hit on two key aspects of our mutual addiction. One is the unfortunate truth that skiing and snowboarding are not particularly cheap past-times. Football and basketball you can play in any street. Running requires but a pair of $70 shoes in your backpack. Coming down a mountain with any kind of grace or skill, however, requires not only access to a mountain (which for many people may mean a long journey), but a generous amount of equipment and clothing. You can rent the equipment for next-to-nothing at most mountains; Hunter has a particularly impressive 3-pack plan that include lift pass, rentals and group lessons, for three days, for just $90. But once you’ve got a bit of mileage under your belt, you’ll chafe at the very thought of continuing to rent beaten-up, over-abused skis or boards and equally dilapidated boots. Sooner or later (hopefully later, preferably at the end-of-season sales), you’ll submit to the credit card charge for your own equipment and that, you hope, will be that. …At least for a couple of seasons and their accompanying season ticket prices it will be, until you discover you’re now skiing terrain beyond the ability of your low-end skis. Or that you want to take a course to improve your skills. Or that your son merits his own board, which, of course, he can’t afford himself. All of this coming before your decision to reward yourself (and your son) for all your hard work (and the east coast’s lack of snow this year) by flying out to Utah for spring break, staying in hotels and racking up the inevitable charges for $10 veggie-burgers and $4 french-fries on mid-mountain lunch breaks. But, as our father-son friends from Hunter also admitted by default, downhill skiing and boarding are addictive sports that extend beyond spending power, down the generations and become something like a family lifestyle. I always get a kick out of seeing dads with their sons on the mountain; for the vast majority of us that are no longer hunters and gatherers, it’s one of the few ways we can pursue our alpha male instincts and push our male prodigies into positions of danger from which they learn important survival skills. (Plus, of course, they find it fun.) I get an equal kick out of seeing entire families on the piste together. We shared our shuttle bus back to the airport with a family of six from Seattle; they had come to Snowbird specifically because it allows kids under twelve to ski and ride free alongside paying adults. (A 70% saving on the holiday, they figured.) Sure, their three boys were either playing gameboys and listening to iPods in the back row of the shuttle bus, but they also had the glow of pre-teens who’d racked up dozens of downhill runs over the preceding three days. There may be an obesity problem in America, but it’s one you rarely see on the slopes. And as for the cost, yes, it is starting to feel prohibitive. Just as well the season is over. But then, how much does a father-son season ticket cost at Selhurst Park these days, let alone Stamford Bridge, Madison Square Garden or Giants Stadium? And do I really get more value for money buying into a spectator sport rather than a recreational and participatory one? The very fact that I’m asking suggests that I’ve found my answer.